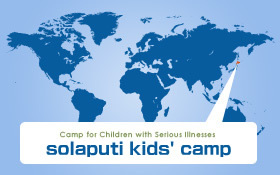 At Solaputi Kids’ Camp, we serve to children with serious illnesses and their families to improve their quality of life by providing outdoor experiences that address emotional and spiritual needs. At our specially-built camp facility, these children and their families can experience the joy of nature through experiential activity programs in a relaxed and safe environment. And thanks to the support of the nearby Takikawa Municipal Hospital, doctors and nurses are always on hand to take care of medical issues. Through the programs at our camp, we aim to offer these children happy memories, wonderful new friends, strength to carry on living, and hope. For inquiries about supporting or working with Solaputi Kids' Camp, or to request an interview, please contact our office via this button. Copyright©SOLAPUTI KIDS CAMP. All Rights Reserved.